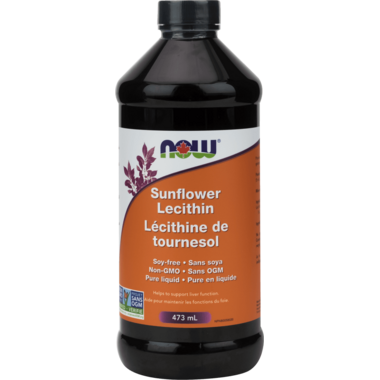 NOW Foods Sunflower Lecithin Liquid has Phosphatidyl Choline, the most abundant phospholipid in the cell membrane. Lecithin is a popular supplement, but there are very few sources of non-soy based lecithin as it is typically sourced from soy. Most soy sources are from genetically modified (GM) crops, where as presently, there are no genetically modified crops of sunflowers. Although phosphatidylcholine phospholipids are present in almost all cells within the body, the highest concentrations may be found in the brain, heart, liver, and kidneys. NOW Sunflower Lecithin also naturally abounds in Phosphatidyl Inositol, Phosphatidyl Ethanolamine, and essential fatty acids. Lecithin in the diet aids in emulsifying fats, enabling them to be dispersed in water; and as a choline-containing phospholipid, its choline is easily absorbed and utilized by the body. NOW Sunflower Lecithin Liquid is Non-GMO and Soy-Free and can be taken directly, or added to foods, beverages, and health shakes. Directions: Take 1 teaspoon (5 mL) daily, preferably with a meal. Mix in juice or shakes, or sprinkle on food. I was looking for a supplement to add to my morning routine. I should have ordered capsules. It is not particularly tasty by itself but I will be ordering its equivalent in capsule form! Tastes terrible. Should have bought in capsule form. This product was exactly what I was looking for. Great to add in a teaspoon with 2 cups coconut oil to make your edible butter. Just tried this for the first time in my vegan butter recipe. Turned out great. Very happy with it. A staple in my cupboard for making vegan butter. Nice that it is NonGMO too. I really like this particular product, it works really well for me then the soy lecithin. I will continue to order from Well.